Freifunk is a non-commercial initiative for free wireless networks. Navigation What is Freifunk about? -> Our Vision How to join us? -> Support our Campaigns -> Find your nearest community Contact us! Google uses open source software for many of its services. Google thanks the Open Source community and support students with a $ 5,500 funded project called “The Google Summer of Code”, which this year, ran from May to August. More than 1,100 students from around the world participated. In 2014, Freifunk participated in the Google Summer of Code, again. Freifunk is like an umbrella organization for several initiatives from around the world: guifi.net, ninux.org, wlan slovenija and libremesh. We were given 9 “slots“ this year, for projects awarded to students in Germany, France, Italy, Spain and Slovenia. The projects include the Freifunk API, network protocols and software for community management. Details about each project can be found on the Freifunk Blog. The conclusion of this year’s Google Summer of Code was the Mentors Summit. Each organization was allowed to appoint two mentors. To celebrate the 10th Annual, participants from earlier years were invited and the Summit was extended by one day. More than 600 participants from around the world met in San Jose, California from Oct. 23. to Oct 26.2014, to discuss and showcase their projects, make new contacts and to celebrate the 10th Google Summer of Code. 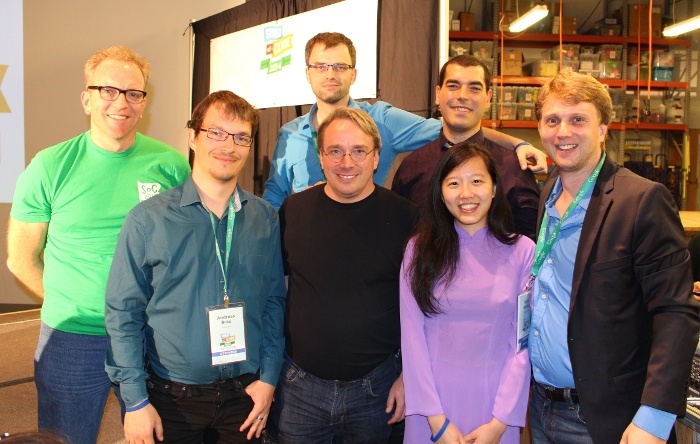 Surprise guest was Linus Torvalds. We had the opportunity to talk to him and tell him of Freifunk. Impressions and pictures of the Mentors Summit can be found on Flickr. We would like to apply again as an organization in 2015. The application itself takes place in February 2015, but we can already gather ideas for projects in the wiki. If you have any contacts with universities or colleges, talk with faculty staff, students, and university professors to get support for projects in the summer term 2015.